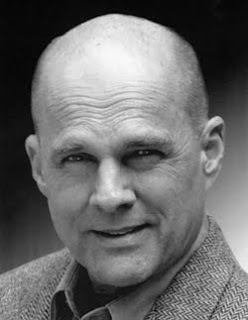 Michael Devlin, our Bonze in Madama Butterfly, has been singing this role for almost fifty years. This veteran of many of the world's great opera house stages has an unusual history with our company: he first sang in Seattle in 1974, as Mefistofele in Boito's opera, and has returned for unusual fare once a decade: Horace Tabor in The Ballad of Baby Doe in 1984, Golaud in Pelléas et Mélisande in 1993, and, four months ago, Leone in Attila. I talked to him, during a dress rehearsal a couple of weeks ago, about his history with Butterfly, about playing religious fanatics in brief, cameo roles, and about how opera has evolved over these fifty years. You’re finally appearing in a normal, standard-rep opera in Seattle! Do you prefer working on a regular, popular opera like this one or the more offbeat repertory you've sung here before? I prefer anything I feel good in, that I can learn—not too modern!—and enjoy singing. These two parts [Leone in Attila and the Bonze in Madama Butterfly] in Seattle this year have been very nicely exposed: I let out a big sound for about a minute, and, at my age, that’s about it! How far back do you go with Madama Butterfly? Butterfly was one of the very first roles I did when I was in the chorus in New Orleans back in the early ‘60s. I was a student at LSU and the conductor said, “Do you think you could do the Bonze, and Yamadori, too?” and I said, “Sure!” So I did ‘em, both, it must have been 48 or 49 years ago. That was the only time I sang Yamadori. I've done the Bonze since then in a few regional companies, and at New York City Opera, at the Met. Who are some of the best Butterflys you remember? There were a couple at the Met. Catherine Malfitano I thought was really wonderful. Did you ever do it with Scotto? She would have been in the ‘70s. No, I wasn’t at the Met when she was there. I think she retired just about the time I came in. 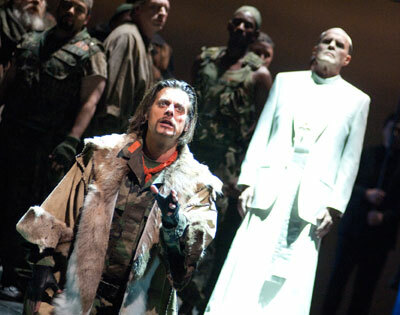 John Relyea (Attila), with Michael Devlin (Leone) in the background, in this season's Attila. When last we saw you, as Leone in Attila, you were a briefly-appearing religious figure of terrifying power. Same goes for this role. What else do these two characters have in common? Well, he’s another religious nut, another extremist—-a fundamentalist—-who would just as soon beat Cio-Cio-San to death for leaving their religion. I think Leone probably felt the same way. So, yeah, they have a lot in common. Have you ever known anyone like that? No, thank goodness. I read about them in the newspaper. There are a few over in the Middle East right now. Some of the ayatollahs are religious extremists, who would literally kill an apostate for leaving their religion. Even a member of his own family. I think so. In our production, you see me moving toward her—-I think he would beat her, if Pinkerton didn't protect her. He would beat her. There’s a neat moment Stage Director Peter Kazaras has added to the story here, between you and Butterfly’s mother. Yes, she wants to comfort her daughter, and I won’t let her. We have excommunicated her, and you can’t go near her now. To you, she is dead, to all of us. Fundamentalist, and extreme. Sad, but true. The great tragedy of the opera is that, by doing what she has done, she has cut herself off from everything. That’s one of the reasons she turns down Yamadori. She’s waiting for Pinkerton, of course, but also she can’t go back. 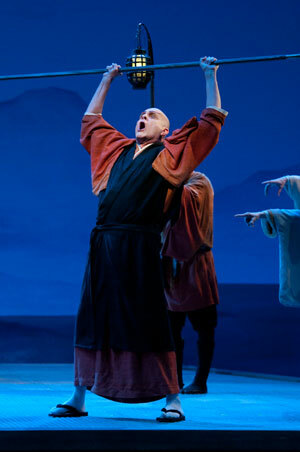 Michael Devlin as the Bonze in Seattle Opera's current production of Madama Butterfly. She’s not Japanese any more, or so she thinks. Speaking of Yamadori, many of the roles in this opera are very small: the Bonze, the other guys at the wedding, Yamadori. Great for people starting out, or finishing, their careers! Beyond getting a paycheck, what’s the satisfaction of performing these ‘cameo’ parts? With an opera like this I get to sit and listen to the beautiful music and not worry about whether I’m going to run out of voice by the end, or get tired! For most of my career I used to do all the leads, but for the last few years I’ve been doing all the supporting parts, and that’s fine. I’m about ready to wind it all up. The satisfaction in doing anything is you do it well, you’re still singing well, you don’t embarrass yourself. How do you know if you’re doing a good job, with these very small parts? You barely have enough time to build a relationship with the audience. Well, first you have to trust the director and conductor. Peter is a very good director; through experience with different directors, you learn which moves work, which make an impact. And you notice with the conductor here [Julian Kovatchev], with my one big excommunication line he takes the orchestra way down, and I sing straight out. You’ve been singing opera for quite some time—this opera, almost 50 years. Can you generalize about how audiences have changed over the years? Wow. I don't know...you’ve got a lot of older people, you’ve got a lot of younger people, you’ve got new people coming in all the time, who are just discovering the power of it, and the older people who, thank God, are still supporting it and dragging the new people to see it, and opening their eyes up. I think the opera audience, God bless ‘em, they’ve always been there, and I hope they always are. Yes! How exciting. I’ve been to a few of the Met HD simulcasts. My one complaint is that, of course, it doesn’t sound the same as it does in the house. But the pluses are the camera-work, the close-ups, the backstage things; they take you behind the scenes and show you changing the scenery, working the props, adjusting the lighting and all that. I think that’s wonderful! Most of the audience never sees anything like that. The few people—family and friends—whom I’ve often taken on backstage tours, at the Met or in Chicago, they were amazed. It pulled them into it, gave them a greater appreciation of what went into putting on an opera. And that’s a wonderful thing to know when you’re sitting and enjoying a performance.